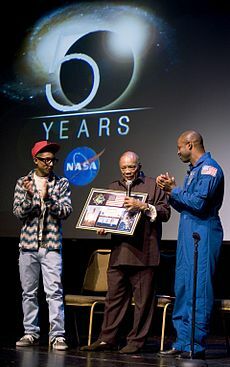 Williams has earned ten Grammy Awards including two with the Neptunes. He is also a two-time Academy Award nominee, receiving a 2014 Best Original Song nomination for "Happy" (which was featured in Despicable Me 2) and a 2017 Best Picture nomination as one of the producers of Hidden Figures. Williams owns I Am Other, a multimedia creative collective that serves as an umbrella for all of Pharrell Williams' endeavors, including Billionaire Boys Club. Williams was born on April 5, 1973, in Virginia Beach, Virginia, the oldest of three sons of Pharaoh Williams, a handyman, and his wife Carolyn, a teacher. His roots extend for generations in Virginia and North Carolina, and one of his ancestors journeyed to West Africa in 1831, prompting other relatives to emigrate from America to Liberia in 1832. He met Chad Hugo in a seventh-grade summer band camp where Williams played the keyboards and drums and Hugo played tenor saxophone. They were also both members of a marching band; Williams played the snare drum while Hugo was drum major. 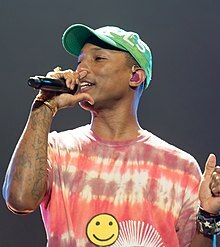 Williams and Hugo attended Princess Anne High School where he played in the school band; there Pharrell got the name Skateboard P. Hugo attended Kempsville High School. In the MTV show When I Was 17, Pharrell stated that he was a nerd and often did things that made him stand out from most of his peers. Williams attended Northwestern University for two years before dropping out. In the early 1990s, Hugo and Williams formed a four-piece "R&B-type" group, the Neptunes, with friends Shay Haley and Mike Etheridge. They later entered a high school talent show where they were discovered by Teddy Riley, whose studio was next to Princess Anne High School. After graduating from high school, the group signed with Riley. Through working with Riley, Williams went on to write a verse and help produce for Wreckx-N-Effect's 1992 hit "Rump Shaker". That same year, he also performed a small rap solo on SWV's second hit, "Right Here (UK Remix)". Williams and Hugo met rap duo Clipse in Virginia Beach in 1993, where they were signed to Arista Records through Williams' Star Trak Entertainment imprint. In 1994, Hugo and Williams had established themselves as a production duo under their old name "The Neptunes", and assistant-produced "Tonight's The Night" from Blackstreet's self-titled album. Over the next three years they continued to produce occasionally, and some of the results had little resemblance to the Neptunes' sound later. However, some like Mase's 1997 song "Lookin' at Me" from his album Harlem World, and the most definite beginning of the distinctive "Neptunes sound", came with N.O.R.E's "Superthug" in 1998, reaching number 36 on the Billboard Hot 100, and gaining them widespread attention for the first time. In 1999, a mutual friend introduced Williams to Kelis, and their resulting collaboration produced her first album Kaleidoscope. At this point the Neptunes were gaining a wide fanbase and audience. In 2000, they produced the song I Just Wanna Love U (Give It 2 Me) (featuring a chorus by Pharrell himself) for Jay Z's album The Dynasty: Roc La Familia, which released as the album's first single. The song's sound and success sparked the interest of maturing pop artist Britney Spears. Britney wanted to work with the Neptunes for her upcoming album, saying "for this album I was really inspired by Jay-Z and The Neptunes, those were the two people I really listened to." In 2001, Britney Spears released her album Britney featuring the lead single "I'm a Slave 4 U", which was produced by The Neptunes. The song was a defining hit in both of their careers, and it was The Neptunes' first time having helped create an album that debuted number one in the Billboard 200. The same year, N*E*R*D, consisting of Williams, Hugo and Haley, released their first album, In Search of..., in Europe, where the first Kelis album was better received. 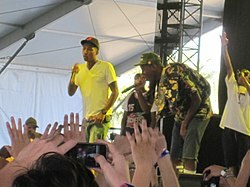 The album sounded very much like their previous production work; the group decided that they should make their work as N*E*R*D sound different, and re-recorded the album with the rock band Spymob. Then in 2002 their re-produced album was released worldwide, and the Neptunes reached number one in the U.S. with Nelly's single, "Hot in Herre". In August of the same year, the Neptunes were named "Producers of the Year" at both the Source Awards and the Billboard Music Awards. Clipse released their commercial debut album Lord Willin' in August 2002. The album started at number one on the Billboard Top R&B/Hip-Hop Albums chart and number four on the Billboard 200, fueled by its first two singles, "Grindin'" and "When the Last Time", which peaked at number 34 and number 19 respectively on the Billboard Hot 100. The Neptunes released a self-credited album called The Neptunes Present... Clones in 2003, with songs and remixes from various artists. This topped the U.S. Billboard 200 Albums Chart. The Neptunes and Williams specifically were also kept in public eye largely due to ties with Jay Z, producing several hit singles for him and two tracks on his The Black Album. The track "Frontin'" was a big hit (the 34th biggest of 2003 according to Billboard). A survey in August 2003 found the Neptunes produced almost 20 percent of songs played on British radio at the time, a survey in the US had them at 43 percent. The same year, the Neptunes remixed the Daft Punk song "Harder, Better, Faster, Stronger" for the duo's poorly received remix album Daft Club. The track also had a brief rap section performed by Williams. N*E*R*D's second funk rock-oriented album, Fly or Die, released in March 2004. Williams's rock credentials were further bolstered by his appearance at the 2004 Grammy Awards, performing the Beatles's "I Saw Her Standing There" on drums with Sting, Dave Matthews, and Vince Gill. Williams received two Grammy Awards that night, one for Producer of the Year, Non-Classical, and another for Best Pop Vocal Album for his work on Justin Timberlake's hit album Justified. They also gained their first UK number one, again with Nelly, and "Flap Your Wings". In September 2004, Williams was featured on the Snoop Dogg single "Drop It Like It's Hot." The song would eventually peak at number one on the Billboard Hot 100 two months later, marking Williams's first number one single in the United States. The song was named "Rap Song of the Decade" by Billboard in 2009. In November 2004, Gwen Stefani released her first debut studio album Love. Angel. Music. Baby. which featured the song Hollaback Girl, which was also produced by The Neptunes. "Hollaback Girl" entered the Billboard Hot 100 at number 82 on the issue dated April 2, 2005, and within six weeks of its release, it had reached the top of the chart, becoming Stefani's first US number one. On September 9, 2005, Williams performed the opening single from his first solo album In My Mind, "Can I Have It Like That", featuring Gwen Stefani. The single did poorly in the US, reaching only number 48. It fared better in the UK, reaching number three. Between then and the July 25, 2006 release of In My Mind, he released "Angel" (in Europe only), and later "Number One" with Kanye West. Several songs leaked to the internet before the album release, most notably "Mamacita" featuring Daddy Yankee, which was subsequently cut from the final version. "That Girl" featuring Snoop Dogg was the final single. In 2006, the Neptunes produced Clipse's second album Hell Hath No Fury. Most critics labeled the album the Neptunes best production in years, and put the duo back in the charts. A year later, Williams collaborated with Madonna, on the song "Hey You", which was available for download on the MSN website. 25 cents for each of the first one million downloads was donated to the Alliance for Climate Protection, in support of Live Earth. Later that year, Williams performed songs at the Concert for Diana on July 1, 2007. On July 7, he performed at the Brazilian leg of Live Earth in Rio de Janeiro. A remix album of Williams's solo debut, In My Mind, titled Out of My Mind, was recorded with his newly formed band "The Yessirs" featuring Questlove of the Roots, and was produced by Questlove and keyboardist James Poyser. However, Williams's record label Interscope Records did not think that the album would sell well and subsequently was shelved. The album has built up a strong fanbase asking for its release. The tracks started appearing on Questlove's MySpace, and with every 10,000 plays, a new song was made available. As of July 4, 2007, the full CD has leaked onto the internet along with two songs not featured on In My Mind: a remix of "Mamacita" and "Creamsickle". Williams produced Beyoncé's version of "Diamonds Are a Girl's Best Friend". He then wrote the Neptunes-produced "Why Should I Be Sad" on Britney Spears' fifth studio album, Blackout. He also produced two songs from the Hives' album, The Black and White Album, titled "Well All Right!" and "T.H.E.H.I.V.E.S.". In April 2008, Madonna released her eleventh album, Hard Candy, which featured vocals from Williams and production from the Neptunes on several tracks. In June, an article in NME revealed that Williams was very interested in producing the Strokes' fourth album. Later that year, Williams worked on a remix album for Maroon 5's Call & Response. Williams continued working with a variety of artists, including Shakira on the songs 'Did It Again', 'Why Wait', 'Good Stuff' and 'Long Time' for her sixth studio album, She Wolf. In September 2009, Williams was credited as a co-writer and producer of the song "Fresh Out the Oven" for Jennifer Lopez. It was released as a buzz single from Lopez's seventh studio album Love?. The following month, Williams made a guest appearance on French rapper Uffie's first album, which arrived in early 2010. In late 2009, Williams worked with the rapper Game on his fourth studio album, The R.E.D. Album. In July 2010, Williams composed the soundtrack to the movie Despicable Me, produced by Hans Zimmer and recorded with the Hollywood Studio Symphony. In October 2010, Williams and his group N*E*R*D supported Gorillaz on their Escape to Plastic Beach World Tour. On the tour, Damon Albarn recorded a song with Williams but this was not featured on Gorillaz's album, The Fall. The following month, N*E*R*D released their fourth studio album Nothing through Williams's label Star Trak. In late 2011, Williams worked on three tracks for Mike Posner's second album Sky High. In 2011, Williams collaborated with singer Adam Lambert, co-writing two tracks for Lambert's album Trespassing, which was released in May 2012, including the title track and "Kickin' In". He has also collaborated with Pittsburgh rapper Mac Miller on the Pink Slime EP. The first track, "Onaroll" was followed by "Glow". It was produced by Williams, with vocals from Mac Miller. Williams composed and produced the music for the 84th Academy Awards alongside composer Hans Zimmer. He also collaborated with Miley Cyrus on her album Bangerz and composed the new intro music for Chelsea Lately in 2012. He later contributed four tracks to The Game's California Republic mixtape called "When My Niggas Come Home" and "It Must be Tough"; produced two tracks on Usher's 2012 seventh studio album, Looking 4 Myself, titled "Twisted" and "Hot Thing"; collaborated with Mika on his new track "Celebrate"; co-produced the tracks "Sweet Life" and "Golden Girl" from Frank Ocean's debut album Channel Orange; and is working with Solange Knowles on her third studio album. Williams was featured on Daft Punk's fourth studio album Random Access Memories on the songs "Get Lucky", "Fragments of Time" and "Lose Yourself to Dance". In addition, Williams contributed to Azealia Banks's debut studio album Broke with Expensive Taste, featuring on the song "ATM Jam". Williams penned three new original songs, included alongside composer Heitor Pereira's score, for the sequel Despicable Me 2. These were "Just a Cloud Away", "Happy", and "Scream" (featuring CeeLo Green). His two original songs from the first film were also reprised on the soundtrack – "Despicable Me" and "Fun, Fun, Fun". He also participated in the drummer sessions of the soundtrack of Man of Steel by Hans Zimmer. In March 2013, Robin Thicke's single "Blurred Lines" – written and produced by Williams – was released. The song peaked at number one on the Billboard Hot 100, and reaching number one in 13 more countries including the United Kingdom and Germany. It was Williams's third Billboard Hot 100 number one single. On June 29, 2013, Williams became the 12th artist in the chart's history to simultaneously hold the number one and two positions with "Blurred Lines" and "Get Lucky", respectively. As of July 2013 there had been only 137 singles in UK chart history to have sold more than 1 million copies; that month, Williams scored two million-sellers with "Get Lucky" and "Blurred Lines". In August 2013, Busta Rhymes talked about an unreleased "documentary album" by Williams where he talks about "inner-city strife and hardship". In November 2013, Williams released the first 24-hour music video to his Despicable Me 2 collaboration song, "Happy". Guest appearances included Magic Johnson, Steve Carell, Jimmy Kimmel, Jamie Foxx, Odd Future, Miranda Cosgrove, Janelle Monáe, and many others. It has received approximately 5.5 million views as of Christmas Day, 2013. The music video for the song is nominated for Best Male Video and Video of the Year at The 2014 MTV Video Music Awards. It was announced in December 2013 that Williams had been nominated for seven Grammy Awards, including Producer of the Year. In the same month, a press release from Columbia Records announced that Williams had signed a contract with the label and would be releasing an album in 2014, entitled Girl, featuring the single "Happy" from the Despicable Me 2 soundtrack. For "Happy", Williams was nominated for the Academy Award for Best Original Song. In February 2014 Major Lazer announced they would be releasing a five-track EP titled Apocalypse Soon on the 25th of that month. The EP, released via Mad Decent and Secretly Canadian, will feature Williams and Sean Paul, among others. The first single off the EP, which features Williams, is titled "Aerosol Can". Williams contributed a verse to Future's February 2014 single "Move That Dope", which also featured Pusha T and Casino over production from Mike Will Made It. On February 18, Williams announced via Twitter that his second album, Girl would be released on March 3, 2014. At the 86th Academy Awards on March 2, 2014, Williams's song "Happy" lost to "Let It Go" from Frozen. Afterwards, when GQ magazine asked Williams "how badly" did he want the Oscar, he responded: "When they read the results, my face was...frozen. But then I thought about it, and I just decided just to...let it go." The Dear Girl Tour was a European concert tour, in support of his second studio album, Girl. It was Williams's first solo tour since 2006. In May 2014, Williams received an Innovator Award at the iHeartRadio Music Awards. On March 31, 2014, Williams was announced as a new coach for the seventh season of The Voice, replacing CeeLo Green. On May 18, 2015, Team Pharrell had 16-year-old Sawyer Fredericks win the eighth season of The Voice. In June 2014, it was announced that Williams would make a guest appearance on the docu-series Sisterhood of Hip Hop. Williams was the executive producer of Atlanta rapper T.I. 's ninth studio album, Paperwork, which was released on October 21, 2014 by Grand Hustle and Columbia Records. In May 2014, Williams curated an art show named after his album, "Girl," at the Galerie Perrotin in Paris, France. The show included 37 artists including Takashi Murakami, JR, Daniel Arsham, and Marina Abramovic among others." Comme des Garçons developed a unisex fragrance with Williams scheduled for release in late 2014. Kaws designed the bottle artwork. In January 2015, Williams and Al Gore announced that they are teaming up to create a 7-continent "Live Earth" concert on June 18 to raise awareness about and pressure governments to act on climate change. He is the musical director. On February 8, 2015, Williams made a cameo in an episode of The Simpsons entitled "Walking Big & Tall" where he comes to Springfield to write a new anthem for the town. Williams recorded three songs for the soundtrack to the animated film The SpongeBob Movie: Sponge Out of Water. He also recorded a song "Shine" with Gwen Stefani for the Paddington movie. At the 2015 Grammy Awards Williams performed an orchestral rendition of "Happy" with composer Hans Zimmer and pianist Lang Lang that included a tribute to the Black Lives Matter "Hands Up, Don't Shoot" movement inspired by Eric Garner's death and the events in Ferguson, Missouri. In 2015, a unanimous jury determined that Williams's 2013 hit song "Blurred Lines" was an infringement of the 1977 Marvin Gaye song "Got to Give It Up". The jury awarded the Gaye family $7.4 million in damages for the copyright infringement based on profits generated. In October 2015, the Tisch School of the Arts at New York University named Williams as their artist-in-residence. He gave the 2017 commencement address at NYU and received an honorary degree on May 17, 2017. Also in October 2015, Williams announced that he will perform with a gospel choir on Sunday, November 1, at Emanuel AME Church in Charleston, South Carolina, where nine black parishioners were shot and killed on June 17, allegedly by a young white man who is awaiting trial. This is part of a program on race relations being produced by A+E Networks and iHeartMedia. Williams plans to speak with community leaders and others affected by the shooting, which dominated the U.S. news media for several days. The two-hour Shining a Light: A Concert for Progress on Race in America program is scheduled to air November 20, and will also feature a concert to be filmed November 18 in Los Angeles. A goal of the program is to raise money for the victims of racial violence and for organizations around the country working to promote racial equity. In the past, Williams has stated that he does not have any direct musical influences, but he has expressed his admiration for several musicians, including Michael Jackson, J Dilla, Stevie Wonder, Donny Hathaway, Marvin Gaye, Rakim, Q-Tip and David Bowie. Williams explained that A Tribe Called Quest's 1990 album, People's Instinctive Travels and the Paths of Rhythm, caused a "turning point" in his life, which "made him see that music was art". In 2005, Williams partnered with Japanese fashion icon Nigo to create and launch the streetwear brands Billionaire Boys Club and Ice Cream footwear. BBC has flagship store in SoHo, New York City and an official Ice Cream store in Tokyo, Japan. Several stores that retail Billionaire Boys Club and Ice Cream clothing exist across North America, the United Kingdom and Europe, as well as Asia and the Middle East. Pharrell and Nigo went on to launch the Billionaire Girls Club. In 2008, Williams co-designed a series of jewelry ("Blason") and glasses for Louis Vuitton. He has also worked on furniture with Emmanuel Perrotin and a French manufacturer, Domeau & Pérès. One of his works, a molded plastic seat with human legs, was created because he "wanted to know what it was like to be in love." The chair depicts a sexual scene with a pair of female legs and male legs. In 2009, Williams unveiled a collaborative sculpture with Takashi Murakami at Art Basel, which spoke to the metaphor of value. In May 2011, it was announced that Williams would serve as Creative Director of KarmaloopTV alongside founder and CEO Greg Selkoe and former AMC president Katie McEnroe. On August 1, 2011, Williams launched his new YouTube channel, "i am OTHER" as part of YouTube's $100 million original channel initiative. In August 2013, Williams created a line of sunglasses for Moncler called "Moncler Lunettes". In February 2014, Williams announced a collaboration between G-Star Raw and his textile company Bionic Yarn called "RAW for the Oceans," a collection of denim made from recycled plastic that is found in the ocean. The project was presented at the American Museum of Natural History in New York City. Williams later appeared on a cover designed by French artist Grégoire Guillemin of New York-based men fashion magazine Adon, covering the collaboration. Williams released a collection for retail giant Uniqlo in April 2014 entitled "i am OTHER". It was created with Nigo, creative director of UT, the company's T-shirt division. In June 2014, artist collective Rizzoli published a book by FriendsWithYou, We Are Friends With You, that featured contributions from Williams, Alejandro Jodorowsky, and Peter Doroshenko. Williams was the executive producer of the 2015 crime comedy-drama film Dope. Williams co-composed The Amazing Spider-Man 2 with Hans Zimmer, Johnny Marr, Michael Einziger and David A. Stewart. Williams owns a non-profit organization called "From One Hand To AnOTHER" (FOHTA). FOHTA is an educational foundation. According to its website, its mission is to "change the world one kid at a time by giving them the tools and resources to meet their unique potential". FOHTA's vision is to modernize the community center concept by empowering kids to learn through new technologies, arts, media and motivation. In 2017, Pharell Williams designed a 1000 euro sneakers in collaboration with Chanel and Adidas. Williams married his longtime girlfriend, model/designer Helen Lasichanh, on October 12, 2013. They have a son, Rocket Williams, born in 2008. The Despicable Me song "Rocket's Theme" was written in honor of his son. In September 2016, they announced that they are expecting another child. In January 2017, the couple welcomed triplets. In 2005, Williams was voted "Best Dressed Man in the World" by Esquire. He is a fan of the science fiction series Star Trek, as indicated by his consistent use of the Vulcan salute to signify his label name, Star Trak. Williams is a skateboarder and has a half-pipe inside his home. Williams is building a $35 million afterschool center in his hometown Virginia Beach. His charity "From One Hand To AnOTHER'" is a foundation developed for youth between the ages of 7 and 20 in at-risk communities throughout the country. In 2015, Pharrell bought a home in Laurel Canyon, Los Angeles. ^ Minton, Melissa (May 22, 2018). "Pharrell Williams Purchased Tyler Perry's $15.6 Million Beverly Hills Home". architecturaldigest.com. ArchitecturalDigest. Retrieved January 12, 2019. "Pharrell Williams has reportedly purchased Tyler Perry's Beverly Hills home for $15.6 million". ^ "BBC". Retrieved December 11, 2011. ^ a b Michaels, Sean (December 18, 2013). "Pharrell Williams signs to Columbia". The Guardian. Retrieved December 22, 2013. ^ "G I R L by Pharrell Williams". iTunes. Retrieved February 24, 2014. ^ Lee, Chris (June 1, 2008). "LA Times". Los Angeles Times. Retrieved December 11, 2011. ^ Kellman, Andy. "Pharrell Williams – Overview". Allmusic. Retrieved March 5, 2009. ^ Bainbridge, Luke (November 5, 2005). "Just Williams". The Guardian. London: Guardian Media Group. Retrieved December 13, 2008. ^ "Pharrell Williams". People. Time. October 13, 2003. Retrieved November 28, 2008. ^ "Why Pharrell Almost Didn't Exist". Megan Smolenyak's Blog. September 2014. Retrieved September 8, 2014. ^ a b Campbell, Melissa (May 15, 2004). "Like the song? These guys wrote it". The Age. Melbourne: Fairfax Media. Retrieved May 22, 2007. ^ Frere-Jones, Sasha (February 8, 2004). "Style; The Sound". The New York Times. The New York Times Company. Retrieved March 5, 2009. ^ Shiver Jr., Jube (February 8, 2004). "Virginia is for hip-hop lovers". Los Angeles Times. Tribune Company. Retrieved March 5, 2009. ^ "Pharrell Williams – When I Was 17 (Full)". YouTube. July 10, 2013. Retrieved July 9, 2016. ^ "Pharrell Williams - profile: Happiness is his truth". The Independent. May 30, 2014. Retrieved April 13, 2018. ^ "Exclusive Hip Hop News, Audio, Lyrics, Videos, Honeys, Wear, Sneakers, Download Mixtapes". Hiphopgame.com. Retrieved February 13, 2015. ^ Kimpel, Dan (2006). How They Made It. Hal Leonard Corporation. pp. 124–125. ISBN 0-634-07642-6. Retrieved March 21, 2009. ^ Brackett, Nathan (September 13, 2002). "New Faces: The Clipse". Rolling Stone. Wenner Media. Retrieved March 21, 2009. ^ Torbati, June (December 8, 2006). "Rap duo 'Clipse' rocks the gangsta hip-hop scene". Yale Daily News. Archived from the original on February 12, 2007. Retrieved March 21, 2009. ^ "Neptunes' Pharrell Williams Rethinks R&B". MTV News. Retrieved February 13, 2015. ^ a b Fekadu, Mesfin (April 11, 2010). "USA Today: Rapper-producer Pharrell has new CD, big plans". Retrieved December 11, 2011. ^ Whitmire, Margo (March 24, 2005). "50 Cent Nets A Fourth Top 10 Hit". Billboard. Retrieved February 3, 2016. ^ Whitmire, Margo (April 28, 2005). "Stefani Single Ousts 50 Cent From No. 1". Billboard. Retrieved February 3, 2016. ^ "Hell Hath No Fury: Clipse: Music: Reviews, Prices & more". Amazon.com. Retrieved November 5, 2010. ^ "Retrieved on May 22, 2007". Liveearth.msn.com. September 15, 2010. Archived from the original on August 21, 2008. Retrieved November 5, 2010. ^ TheHipHopIcon.com (September 14, 2007). "Pharrell Williams goes Out of His Mind". TheHipHopIcon.com. Retrieved September 16, 2007. ^ "NME News Pharrell Williams: 'I want to produce The Strokes' new album' - NME.COM". NME.COM. June 13, 2008. Retrieved February 13, 2015. ^ Cohen, Jonathan (October 31, 2008). "Pharrell, Oakenfold, Of Montreal Remix Maroon 5". Billboard. Nielsen Business Media. Retrieved November 2, 2008. ^ "Music – News – Shakira: 'Pharrell taught me a lot'". Digital Spy. October 10, 2009. Retrieved November 5, 2010. ^ "Pink, Paramore, Death Cab, Katy Perry, Ne-Yo and More: VMAs Interviews You Didn't See on TV". Rolling Stone. Retrieved November 5, 2010. ^ "Interview: Pharrell Williams of N*E*R*D. talks his "Despicable Me" Soundtrack". ARTISTdirect. Retrieved July 5, 2010. ^ DelaCuesta, JP (December 7, 2011). "Mike Posner: From His Mother's Basement To Here". AllHipHop. Retrieved February 21, 2012. ^ Brown, August (February 24, 2012). "The Oscars: Hans Zimmer and Pharrell Williams know the score for the telecast – they wrote it". Los Angeles Times. Retrieved March 6, 2012. ^ "Usher Hits The Studio With Pharrell, Jim Jonsin & Diplo". This Is RnB. November 6, 2011. Retrieved May 6, 2012. ^ Gore, Sydney (July 3, 2013). "Azealia Banks Premieres Pharrell Williams-Assisted, 'ATM Jam': Listen". Billboard. Retrieved July 5, 2013. ^ "Pharrell Williams Gets 'Happy' on 'Despicable Me 2' Soundtrack". Rolling Stone. May 21, 2013. Retrieved July 27, 2013. ^ "Man of Steel Soundtrack – Percussion – Hans Zimmer". YouTube. June 24, 2013. Retrieved July 27, 2013. ^ Trust, Gary (June 26, 2013). "Robin Thicke Still Atop Hot 100; Miley Cyrus, Bruno Mars Reach Top 10". Billboard. Retrieved June 26, 2013. ^ "Robin Thicke's 'Blurred Lines' Hits No. 1 on Hot 100". Billboard. June 12, 2013. Retrieved July 27, 2013. ^ Ortiz, Edwin. "Busta Rhymes Discusses "Scenario," A Tribe Called Quest & Chris Lighty – The Combat Jack Show Episode 3". Complex. Retrieved February 13, 2015. ^ "Pharrell Williams – Happy: The World's First 24 Hour Music Video". Retrieved November 21, 2013. ^ Ryzik, Melena (December 25, 2013). "Round-the-Clock Giddiness in a 24-Hour Music Video". New York Times. Retrieved December 26, 2013. ^ "Best Male Video 2014 MTV Video Awards". MTV. August 24, 2014. Retrieved August 24, 2014. ^ "Video Of The Year 2014 MTV Video Music Awards". MTV. August 24, 2014. Retrieved August 24, 2014. ^ "Grammy Nominations: Jay Z Leads But Timberlake, Other Stars Shut Out of Top Categories – Variety". Variety. ^ "Major Lazer – Apocalypse Soon EP". Retrieved February 6, 2014. ^ "Future – Move That Dope Feat. Pharrell, Pusha T & Casino (Prod. By Mike WiLL Made It) | Stream & Listen [New Song]". Hotnewhiphop.com. February 6, 2014. Retrieved March 3, 2014. ^ "Pharrell Announces New Album "Girl"; Reveals Cover & Release Date". Hotnewhiphop.com. February 19, 2014. Retrieved March 3, 2014. ^ Baron, Zach (March 2014). "Pharrell Williams on Advanced Style Moves and That Oscar Snub: My Song Will "Be Here For 10 Years"". GQ. Retrieved March 31, 2014. ^ MTV, Lisa. "Dear Girl Tour". MTV. ^ "Rihanna Wins Big At iHeartRadio Awards: See The Winners List". MTV. May 1, 2014. Retrieved May 1, 2014. ^ Respers, Lisa (March 31, 2014). "Pharrell Williams joining 'The Voice'". CNN. Retrieved April 3, 2014. ^ Super User. "T.I. Talks Working With Executive Producer Pharrell Williams For His "Paperwork" Album". Power1049.com. Archived from the original on November 2, 2014. Retrieved February 13, 2015. ^ "Art and Fashion Stars Toast a Pharrell-Curated Exhibition in Paris". The New York Times. Retrieved February 13, 2015. ^ "Pharrell Williams Comme Des Garcons Fragrance Collaboration GIRL (Vogue.co.uk)". Vogue UK. Retrieved February 13, 2015. ^ "Pharrell Announces 'Live Earth' Global Climate Concert – Business Insider". Business Insider. January 21, 2015. Retrieved February 13, 2015. ^ Snierson, Dan (January 22, 2015). "Pharrell to guest on 'The Simpsons' – exclusive". Entertainment Weekly. Retrieved January 22, 2015. ^ a b "'Blurred Lines' jury finds for Marvin Gaye". Usatoday.com. Retrieved March 12, 2015. ^ Daley, Megan (September 23, 2015). "Pharrell Williams: NYU Tisch School of the Arts artist in residence". EW.com. Retrieved July 9, 2016. ^ Communications, NYU Web. "Pharrell Williams, the Musician, Songwriter, and Producer, to Speak at NYU's Commencement". Retrieved December 10, 2017. ^ a b Kondo, Toshitaka. "Pharrell Williams, Accidental Crooner". VH1. Retrieved July 6, 2009. ^ a b Scaggs, Austin (November 17, 2005). "Q&A: Pharrell Williams". Rolling Stone. Wenner Media. Retrieved July 6, 2009. ^ "David Bowie: Friends and stars pay tribute". BBC News. January 11, 2016. Retrieved February 9, 2016. ^ "Shop Billionaire Girls Club at BBCIcecream". Bbcicecream.com. June 23, 2016. Archived from the original on October 6, 2015. Retrieved July 9, 2016. ^ "Hip-hop's glittering touchstone". The Australian. News Corporation. February 27, 2009. Archived from the original on March 4, 2009. Retrieved March 11, 2009. ^ "Interview with Pharrell Williams at Art Basel 2009". YouTube. June 11, 2009. Retrieved February 13, 2015. ^ "Pharrell Williams Named Creative Director at Karmaloop TV". The Hollywood Reporter. May 9, 2011. Retrieved March 28, 2012. ^ HipHopDX (August 1, 2011). "Pharrell Williams Launches His New Label, i am Other Records". HipHopDX. Retrieved February 13, 2015. ^ "First Look: Pharrell x Moncler Lunettes Sunglasses Collection". Highsnobiety. Retrieved February 13, 2015. ^ David Yi. "Pharrell to Collaborate With Adidas". WWD. Retrieved February 13, 2015. ^ Rooney, Kyle (July 18, 2016). "Adidas NMD "Human Race" collection to be released on July 23, 2016". Retrieved July 18, 2016. ^ "Pharrell Williams, G-Star to launch eco-friendly denim line". NY Daily News. Retrieved February 13, 2015. ^ "Adon Magazine, August 2014 issue,". adonmagazine.com. Retrieved August 1, 2014. ^ "Pharrell Williams Collection For Uniqlo T-shirt Collaboration (Vogue.co.uk)". Vogue UK. Retrieved February 13, 2015. ^ "We Are FriendsWithYou Written by FriendsWithYou, Contribution by Pharrell Williams and Alejandro Jodorowsky, Introduction by Peter Doroshenko – Rizzoli New York – Rizzoli New York". Rizzoliusa.com. Retrieved February 13, 2015. ^ "Dope". Official website. Retrieved September 5, 2015. ^ "Pharrell Talks eBay Collab, Beyonce's Album, Scoring the 'Spider-Man' Sequel and More". Billboard. Retrieved February 13, 2015. ^ Ford, Rebecca. "Marc Webb, Hans Zimmer Form Supergroup for 'Amazing Spider-Man 2'". The Hollywood Reporter. Retrieved February 13, 2015. ^ "Pharrell Williams & The Ultimate Charitable Hat Trick". Forbes.com. ^ Diderich, Joelle (November 22, 2017). "Chanel and Pharrell Williams Drop World's Most Exclusive Sneakers". WWD. Retrieved November 23, 2017. ^ Webber, Stephanie (October 12, 2013). "Pharrell Williams Marries Helen Lasichanh, Usher and Busta Rhymes Perform: All the Details!". Us Weekly. Retrieved October 12, 2013. ^ "Pharrell Williams Biography: Music Producer, Musician, Singer (1973–)". Biography.com (FYI / A&E Networks). Retrieved January 31, 2017. ^ imageplaybuttons (April 5, 2012). "Pharrell Williams | Clue Mag". Cluemagazine.wordpress.com. Retrieved July 27, 2013. ^ "Pharrell Williams and Helen Lasichanh Welcome Triplets". ^ "Pharrell Is The World's Best-Dressed Man (According To Esquire, Anyway)". MTV News. Retrieved February 13, 2015. ^ "The nerd who inherited the earth". Archived from the original on March 11, 2007. Retrieved May 19, 2017. CS1 maint: BOT: original-url status unknown (link). Retrieved on May 22, 2007. ^ "Maxim". Blender.com. Archived from the original on December 16, 2008. Retrieved February 13, 2015. ^ "Not A Joke: Pharrell Builds A Stunning, $35M Afterschool Space For Kids | Co.Design: business + innovation + design". Fastcodesign.com. June 20, 2011. Archived from the original on December 12, 2013. Retrieved July 27, 2013. ^ "Inside Pharrell's $7 Million Los Angeles Home". BallerStatus.com. May 30, 2015. ^ "Pharrell Williams Singer releases stimulating 'Freedom' video". Pulse.com.gh. Joey Akan. Retrieved February 22, 2016. 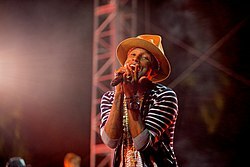 Wikimedia Commons has media related to Pharrell Williams.